My grandfather who was a great maker of polenta called it "mush", as it was commonly eaten during Roman times. It seemed as though he stood at the stove for hours stirring and stirring until it was just the right consistency. No fancy sauces were put on this delicacy; it was just pored out hot onto a wooden board and you raced to dig right in before it disappeared. Later in life, Grandpa loosened from his traditional roots. He added red meat sauces and other salted meats; such as bacon or pancetta, and even anchovy to dress the polenta. He passed his pot on to me, so I ran with it and continue the family tradition today. 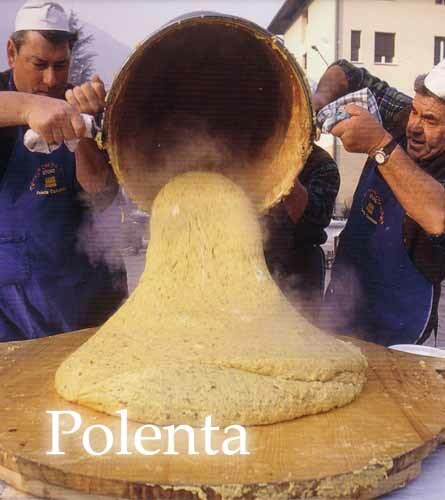 Polenta is made with ground yellow or white cornmeal and is often cooked in a huge copper pot, known as paiolo, for even heating. Traditionally polenta is a slowly cooked dish; it can take an hour or longer, and constant stirring is a must. The time, dedication and arm-stirring labor of traditional preparation methods has sparked the way for many shortcuts today. There is now instant polenta available from Italy that allows for quick cooking - kind-a-like instant grits, or there's fully cooked polenta in a tube that requires only slicing and reheating. 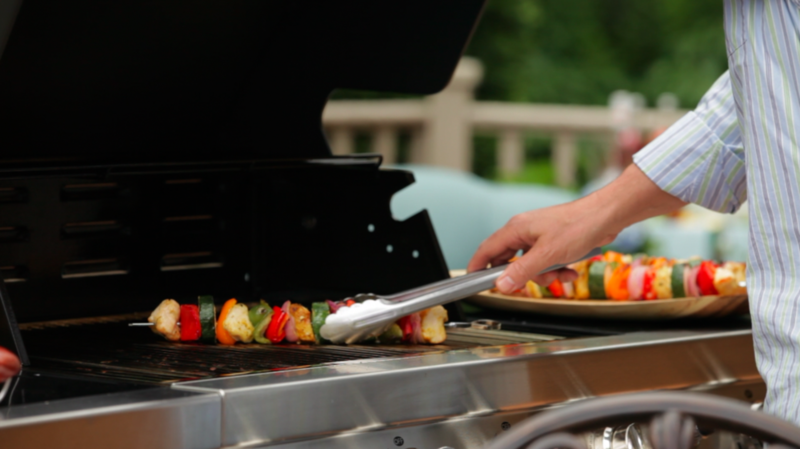 I suggest reheating by grilling, roasting, sautéing or baking, then top with your own creative sauce. It may not be Grandpa’s, but if in a pinch, try it with my favorite recipe; grilled topped with a sauce of creamy gorgonzola and crispy pancetta. I'm a fast cook, I guess - reminds me of the classic line from the movie My Cousin Vinny. Mr. Tipton: “I don't know, I'm a fast cook I guess.” AS IF THERE IS SUCH A THING AS MAGIC GRITS! Vinny Gambini: "So obviously it takes you 5 minutes to cook your breakfast." Vinny Gambini: "That's right, so you knew that. You remember what you had?" Mr. Tipton: "Eggs and grits." Vinny Gambini: "Eggs and grits. I like grits, too. How do you cook your grits? Do you like them regular, creamy or al dente?" Mr. Tipton: "Just regular I guess?" Vinny Gambini: "Regular. Instant grits?" Mr. Tipton: "No self respectin' Southerner uses instant grits. I take pride in my grits." Vinny Gambini: "So, Mr. Tipton, how could it take you 5 minutes to cook your grits when it takes the entire grit eating world 20 minutes?" Mr. Tipton: "I don't know, I'm a fast cook I guess." Vinny Gambini: "I'm sorry I was all the way over here I couldn't hear you did you say you were a fast cook, that's it?" 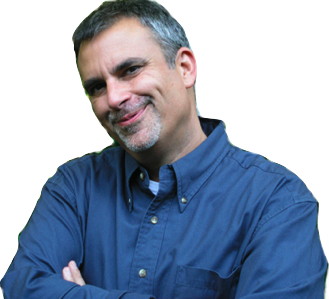 Vinny Gambini: "Are we to believe that boiling water soaks into a grit faster in your kitchen than anywhere else on the face of the earth?" Mr. Tipton: "I don't know." Vinny Gambini: "Well, I guess the laws of physics cease to exist on top of your stove. Were these magic grits? Did you buy them from the same guy who sold Jack his beanstalk beans?"